Every hardwood floor I have seen is worth preserving and protecting. When I see an area rug on the floor, I am always amazed when there is no rug pad under the rug to help protect the hardwood floor. A rug pad can provide so much protection that the small investment in buying one could save much in damage to the floor. There is really only one type of rug pad I like to use under any area rug on a hardwood floor and that is a solid felt rug pad – Not just any felt rug pad, as we need to be careful not to introduce any adhesive, chemical or latex to your hardwood floor, so a more natural felt rug pad is ideal. When manufacturing our Superior and Ultra Premium Felt rug pads, I am a stickler for content – I refuse to accept any padding that contains any adhesive, chemical or latex and my mills know this, so we’re on the same page. Next, the felt rug pad must be dense enough to offer effective protection to any hardwood floor and this means using enough pressure with the production to assure a more dense padding – Our felt pad is needle punched together, so we make sure that the rate of punching results in a very dense rug pad resistance. The combination of a rug pad without any additives, along with the most dense pile makes for the most effective protection to your hardwood floors. So, I have seen those felt rug pads that contain a clear adhesive on each side and I have seen what the floor looks like after a few years of using this pad – A filmy layer of adhesive gathers on the hardwood floor and while some of this can be removed, some cannot and requires expert floor refinishing. Let’s avoid such headaches and use our Superior or Ultra Premium rug pads instead and never have to worry about what’s happening to the hardwood floor under the rug. Superior and Ultra Premium contain a recycled felt material that does not have any chemical or adhesive and I’ll tell you how we avoid this. The common adhesive coating is used to keep the felt fibers together as it hardens and acts as a force to prevent shedding of the rug pad. This is great, yet not very desirable as the potential is for clear damage to your hardwood floor. Instead, Rug Pad Corner utilizes an intense heat pressing process in which heat is used to press the felt together and keep it from shedding. While this can cost us more than using an adhesive, the benefits are obvious and you will never need to worry about your hardwood floors or the air you breath – Adhesives normally off-gas, causing odors and the potential for us to breath in obnoxious odors. The heat pressing process offers no side effects at all other than a safe and perfectly protected hardwood floor. Our felt rug pads are so dense that you can try to push your finger through them to no success – the amount of resistance from them is such that nothing will be able to push through to affect the hardwood floor underneath this. Let’s consider that popular foam padding that is used under most wall-to-wall carpeting. This type of pad offers a very plush feel because it allows the foot to sink down into it, often times allowing us to feel the floor underneath. We can see from this lack of resistance in the carpet padding, that many things can push through and affect the floor. Our exclusive needle punching process is so extreme that it does not allow even the heaviest of furniture to penetrate it to reach the floor underneath -this means that the hardwood floor under your area rug will always be protected from dents and scratches that can normally happen from high heeled shoes and sharper furniture legs. Leave it to Superior and Ultra Premium rug pads to keep your floor as new and perfect as can be. Felt rug pad has become a very popular padding for use under area rugs today and while I prefer it to many others, it is important to note that it’s what goes into the making of the padding that makes it ideal. Stay away from those commercial felt rug pads that contain adhesives and chemicals – While you might save a few dollars now by buying one of these, the long-term will prove much more expensive with much damage to your hardwood floor. It’s one of the most common household issues – What to use under your furniture to protect your hardwood floor? While you can find all types of felt furniture pads to use under your furniture, unfortunately those allow furniture to slide and they rarely last long enough. We know this problem, we’ve had to deal with it and we did something about it – We created DURA-GRIP® pad to place under all types of furniture to prevent any damage to your hardwood floors. Unlike the common felt pads found in most stores, DURA-GRIP is much different. It is a 3/8″ thick pad that is made of a dense fiber center with a layer of natural rubber on the top and bottom surfaces. So, the dense center works to prevent penetration to the floor, keeping any weight of furniture from affecting the floor. The natural rubber sides work by the top adhering to the furniture to hold it in place and the bottom grips to the floor to prevent sliding – The result is a furniture gripper pad like no other that keeps all types of furniture in place on all floors and prevents damage to those floors. We make DURA-GRIP in our own warehouse through a multi-step process. Excess cuts from our rug pad orders are utilized in the manufacture of DURA-GRIP. Through a few steps, we attach two pieces of our Ultra Premium rug pad together to form the finished product. Since there are various types and sizes of furniture, we offer DURA-GRIP in round and square shapes and ten sizes – there’s sure to be one available for any piece of furniture. And, for those unusual shapes and sizes, we also offer custom DURA-GRIP made to fit any shape and size. For recliners, DURA-GRIP has become quite popular as we custom make it to fit perfectly under the base of the recliner keeping it in place under all uses. Ordering DURA-GRIP is simple at www.rugpadcorner.com. You choose the shape and size closest to your furniture leg and place your order – There are sets of four and eight, so be sure to choose the amount necessary to place under each furniture leg. We’ll ship your order within one business day and when you receive it, you can put them to good use. The pad will have tan colored rubber side and a purple colored side – Place the purple side against the floor and tan side against the furniture. That’s it, theres nothing to stick or nail and DURA-GRIP starts working immediately. If you have furniture that is always moving and you would like it to stay in place, try DURA-GRIP furniture gripper pads – These pads are very effective for use on all hard floors and now available for furniture on carpet as well. Unlike any other, our pad simply sits under furniture without any sticky mess or anything to tack or nail. That said, you may use it under any other furniture when necessary. If you have ever had, or have, an active dog in the house, you will understand the benefits of using the right rug pad under any rugs you may have on your floor. Most dogs, especially younger ones, love to run and without the right rug pad under your rugs, this can cause all sorts of rug slipping and sliding. Unfortunately, besides the fact of the rugs being shifted, this can also cause harm to the dog, so we must be sure to anchor the rugs in place and the right non slip rug pad does just that. We recently added a pet to our family, a beautiful German Shepard, and at the time we got her, she was 3 months old. Shortly after we brought her home, we noticed how active she was and we realized we need to be sure to use the right rug pads under our rugs before she starts to slide and possibly gets injured. Our foyer rug had our Superior rug pad under it – A solid felt rug pad without any rubber in it, so it does not prevent slipping. Before Maia(our dog’s name) came into the picture, this rug pad did just fine. However, with Maia’s active lifestyle of running around the house, soon enough that foyer rug was slipping and sliding everywhere! Not only was the entire combination of rug and pad slipping, but there were times when the rug was shifting off of the pad, leaving the edges of the pad exposed. My wife was so concerned that soon enough, Maia may cause harm to herself with one of her lunges across the foyer, so I had to do something very soon, and I did. As nice as the feel of Superior rug pad is to walk on, I immediately replaced it under our foyer rug with Ultra Premium – A felt and rubber non slip rug pad that truly prevents all types of slipping. Since the foyer rug is a 5′ x 8′ size, I had the Ultra Premium rug pad cut a few inches smaller to keep the edges of the rug to the floor. Once it was ready, I brought the rug pad home and placed it under the foyer rug. Of course as soon as she saw this, Maia had to give it the “test”, as she ran and slid onto the rug. Finally, to our complete satisfaction, the rug stayed in place and so did Maia! We were always concerned that she would forget herself and one day run so fast, slide on the rug and possibly hit the wall and hurt herself – Thankfully, we were able to place the correct rug pad under the rug before any possible harm to Maia. In considering a non slip rug pad to keep your rugs and pets safe, most people think of the pad working to keep the rug and pad in place. This is one way a non slip rug pad works. Not many people think of the other non slip quality that a rug pad should offer – The rug itself staying in place on top of the pad. Since most rug pads contain a smooth upper surface, many times a rug can shift off of the pad, allowing the rug pad to show beyond the edges of the rug. While acceptable to a certain degree, is it best when the non slip rug pad can prevent slipping on the top and bottom of the pad. One of the exclusive benefits of Ultra Premium rug pad is that it is manufactured to give it a distinct texture on the felt surface. The grooves within the surface work to grab to and hold the area rug that sits on it and the result is for the rug to stay in place on top of the pad. Most other rug pads work to prevent slipping on the floor, yet with a smoother upper surface, they rarely prevent the rug from slipping off of the pad – The result is a rug that constantly slips off of the pad, making for constant adjustment of the rug. Fortunately, with the exclusive features within Ultra Premium, the rug stays in place and require little to no adjustment, keeping everyone happy, even our dogs. If you are like our family, then your dog has free reign of the house. Based on this, it is extremely important to prevent any harm to your pets. Area rugs on the floor can add much beauty and charm, yet this quickly disappears when the rug keeps slipping off of the pad and when pad keeps sliding on the floor. Use of a non slip rug pad will add the safety required for your dog to enjoy his/her active lifestyle and will prevent constant readjustment of the rug, so that we don’t need to worry. Be sure to remember that the right non slip rug pad should prevent slipping on the top and bottom of the pad. Most often, this is not the case and the pad is only non slip on one surface, the lower surface. If your home and lifestyle is like ours and requires the most effective non slip function, then a rug pad such as our Ultra Premium is the ideal choice. You may visit Rug Pad Corner for more on Ultra Premium. What do rug pads have to do with children? If your children are like mine, they love the floor – To play, roll around, sit and eventually nap – This puts them in direct contact with the rug and rug pad. The rug pad we choose to place under our area rug can dictate the difference between keeping the floor safe or unsafe for our children. Unfortunately, most rug pad manufacturers today tend to use chemicals and adhesives within their rug pads – This popular practice is proven to save on production costs and since many people search and purchase by “price” only, more and more rug pads today are made with lower cost materials. Since applying a coating of adhesive on each side of a felt rug pad saves manufactures money over the alternative method of using heat to press the felt together, many pads today are coated with adhesive. When children are playing on the floor, or on the rug that sits on top of the rug pad, they are just about in direct contact with the pad. The adhesive within a rug pad normally possesses a chemical-like odor that can pass through the rug to fill the room and all within it, such as furniture and cloths. My kids are really sensitive to smell and they wouldn’t put up with this for a minute! When heat is added to the room, such as that from normal heating systems or from sunlight coming into the room, the adhesive can off-gas; This is a process in which a gas is given off as a by-product of a chemical, or chemical-like, agent. Now, try to tell your kids why this is all happening! Children should be able to play on the floor without any risk of being exposed to a strong chemical-like odor. This is one of the main reasons we at Rug Pad Corner manufacture our rug pads without the addition of adhesive or chemicals. I remember once bringing home a rug pad as a “test” from another store. I ordered it online as a “Natural Felt rug pad made in the USA”. As soon as I placed it on the floor, my kids made their funny face, the one they make whenever mom cooks something of which they don’t like the smell. I told them the smell might be from the plastic wrapping, so let’s just open the pad and see what happens. Not before long, the kids put it to the test as one started building a Lego structure, the other reading a book and another just sitting to watch TV. Within an hour, all 3 kids started to complain about the smell, for which I knew the reason, yet I wanted to see their reaction. Needless to say, I exposed the pad and started to scrape a knife on the surface and it was just as I suspected – I was scraping off a layer of dry adhesive, the source of the offensive odor. My kids wondered what I was doing and I joked as I told them I was “dissecting” the pad like a doctor to see what was wrong with it, why it had the odor. We take great steps to maintain a safe environment for all children by the method we use in the manufacture of our rug pads. In a time when most manufacturers look at the bottom line with the use of more and more chemicals and adhesives to cut the cost of producing their rug pads, Rug Pad Corner is using more of a genuine level of manufacture with the use of heat. Developed and sustained by Rug Pad Corner, the trademarked process referred to as RPC Heat Pressed® uses intense heat to press the felt together within our felt rug pads. Others apply an adhesive that dries to a stiff texture, yet we apply intense heat, almost like a huge iron, to compress the material together – The result is a very dense rug pad that will not shed or separate and the best part of all is that it will not smell or off-gas. Add to this exclusive process of heat pressing the fact that the actual felt fibers within all of our felt rug pads are made of recycled materials, our Ultra Premium and Superior rug pads are some of the finest and most natural rug pads that exist today. This means that children can not only play on top of the rug, they can also literally roll directly on the padding itself without the risk of any harm, allergic reaction or discomfort. We take the natural elements within our rug pads to another level and make then as safe as possible for all children and people to use and enjoy – That said, it goes without saying that our rug pads are rated as safe for hardwood and all types of floors. Our children and their safety are a top priority in all that we do. I want them to have as much fun as possible without any concern over their exposure to unnecessary elements, such as a chemical within a rug pad. Since we are all about rug pads, we do our share to assure you of the safety of your(our)children – When they are on one of our rug pads, let them play, roll around, sit and even fall asleep. After all, they are in good hands with Rug Pad Corner on the floor. Handmade area rugs offer many benefits, are enduring and are often referred to as works of art for the floor. While all of these are reasons to invest in one, another great benefit is the ease in caring for them – It is surprisingly easy to care for and repair almost anything within a handmade rug. Unlike machine made rugs, handmade rugs are just that, made by hand. Respectfully so, they are also repaired by hand when the need arises. Fortunately, good handmade rugs can endure years of use and wear before the need for repair, yet when that need arises, the right person will put you at ease as they offer expert repair to restore your rug back to condition. We would say that handmade rugs are quite versatile on many levels. Repairing missing fringe, most likely the result of constant vacuuming of the fringe. One of our clients had a huge plant pot sitting on a part of their handmade Persian rug – A beautiful palette of traditional jewel tones set within this now antique carpet. As one of the most common causes of damage to rugs, the plant pot was seeping out water every week and when this was finally discovered, the rug contained what is referred to as “dry rot” – The affected area actually dried out to the extent that it fell out from the rest of the rug, leaving a hole in its place. After time, the water that escaped into the rug reached the foundation cords of the rug, dried into these cords and created the dry rot. Fortunately for the client, we know of an expert weaver who was willing and able to restore their rug to it’s previous condition. A miniature loom was made to accommodate the affected area of the rug. To begin with, a set of cotton cords are intertwined around each other from left to right and top to bottom on this wooden loom and this created the (new)foundation for the repair. On this foundation, our weaver would then wrap and hand tie individual strands of dyed wool to reflect the original missing pattern within the rug. To any trained repair person, this was not an impossible task, but a tedious one of hand tying thousands of strands of wool to recreate the missing pattern within the rug. Since the client understood the capacity of the repair, time was allowed for the restoration, estimated to be approximately one year. When considering the decision of whether or not to go through the expense and time of such repair to a handmade rug, we need to evaluate the actual value of the rug – This antique rug of this proportion is valued at over $30,000 with great sentimental value, so the client opted to repair and pay and wait. While the repair was estimated at $7500, no amount of money could replace the rug with another of the same – This over 100 year old rug is truly one-of-a-kind and quite large at that, hence a true investment quality rug. If the repair is done properly, most of the rug’s value will stay with it, instead of be lost, another benefit of handmade rugs with the proper care. We have seen hundreds of such unfortunate instances happen to handmade rugs over the years and with each one, we know that quality restoration will bring the rug back to life. The more common causes of damage are that of vacuums damaging the fringes of a rug, plant pots causing dry rot that lead to holes within a rug and fireplaces throwing hot ashes and causing burn holes in a rug – All of these types of damage can fortunately be repaired and the cost and time involved are all relative to the extent of the damage. In this sense, handmade rugs are quite easy to care for, as some points of damage do not mean that the rug should be disposed of – On the contrary, the rug can be restored and back to its normal use. • When possible, avoid placing plant pots on your rug and if necessary to do so, be sure to protect the bottom of the pot from any possible leakage. • When vacuuming a handmade rug with fringes at the ends, never allow the fringes to be sucked into the vacuum – This constantly frays the fringes to the point of extreme wear. • Try to rotate your rug once a year to prevent a common wear pattern – Rotation will spread any where and prevent one part of the rug wearing much more than the rest of the rug. • Always try to use a quality rug pad under all of your rugs to preserve the rug and floor, as well as add comfort and safety. Your handmade rugs are truly an investment as well as a work of art and while they are easy to maintain, it’s always best to prevent any unnecessary damage and premature wear. Try to pay attention to some simple preventative tips and your rugs should be around for a lifetime, as they were made to be. Everyone knows that an area rug can be used to add warmth and texture to a room. More recently there has been an increased use of multiple rugs in one space. Layering rugs is a great way to elevate the style of a space, bring added comfort, and save you money! Check out our tips on how to incorporate this design trend into your home. If you want to try out the layered rug look, it is best to start with a neutral base. Jute, and sisal rugs are great options for a neutral base. These rugs are environmentally friendly and relatively inexpensive. These rugs are very sturdy as well, making them great for high traffic areas and homes with young children. Jute and sisal rugs also typically come in neutral tones. This makes them a great base for layered rugs. Jutes and sisals are some of the most popular rugs used in layering. If you have neutral wall-to-wall carpeting try adding a small area rug to define spaces throughout the room. If you have a large bedroom with a sitting area, use an area rug to anchor that sitting area on top of your wall-to-wall carpeting. It will add interest to your space and make the floor even more comfortable. The average homeowner does not think to add an area rug on top of their wall-to-wall carpeting. But typically, wall-to-wall carpeting provides the perfect neutral base for a brightly colored/patterned rug. If you want to get adventurous with the layering effect you can layer rugs with multiple colors and patterns. 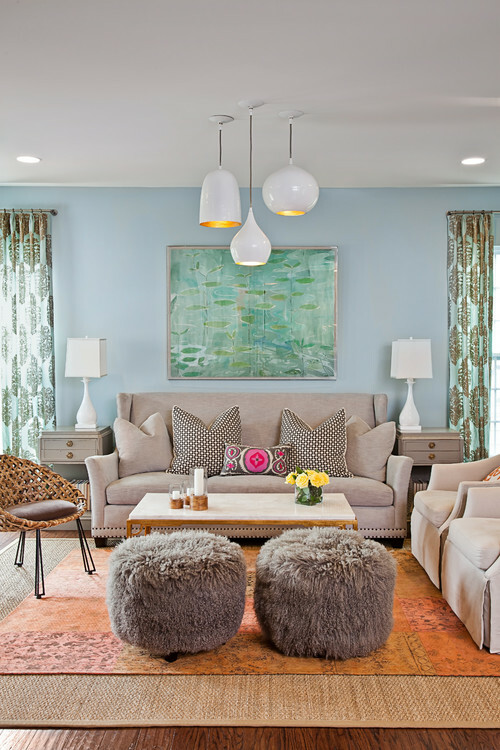 It is important to understand that while mixing colors and patterns for added interest to a space, it can also create a chaotic look. When choosing rugs with multiple colors it is important to choose rugs within a similar color family. It is also important for layered rugs to have similar patterns as well. A chevron pattern with a circular pattern rug will create a disorganized look. So if you do try layering with multiple colors, try one solid rug underneath a patterned rug in a similar color scheme. The one exception to this rule is oriental rugs, oriental rugs tend to have a similar color palette and similar themes within their patterns, making them easier to mix and match than most patterned rugs. Using multiple smaller rugs in a space is a perfect way to cover your floor and spend less money. Larger room-sized rugs can be costly. By pairing multiple smaller rugs you can get the coverage you need at a fraction of the price. Using a small plush rug is also a great way to get extra comfort and add dimension to a room with wall-to-wall carpet. Consider adding a plush rug next to your bed or in a nursery to create added padding. You do not have to add the layered look to every room; that might be excessive. Rather, start with a larger room. The living room is the perfect space to use a neutral base with a patterned design. This brings texture and depth to the room and makes the patterned rug stand out. It also creates a more welcoming environment if people ever need to sit on the floor. 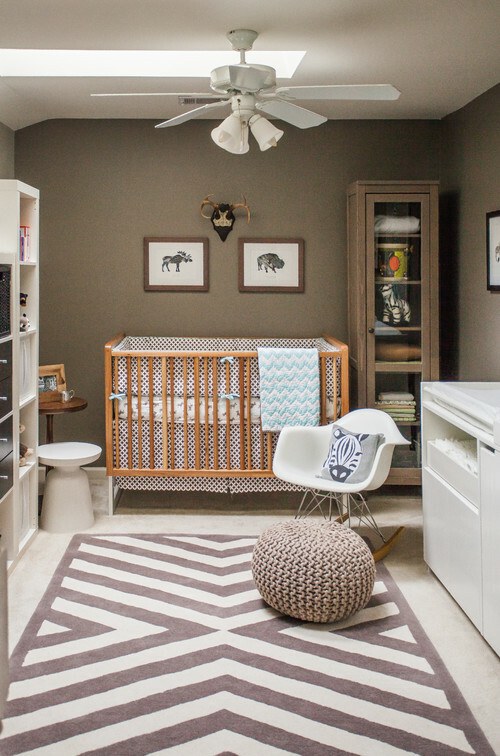 Bedrooms and nurseries are other spaces that are perfect for incorporating the layered look. This creates added comfort and prevents your feet from being cold when you step out of bed and onto the floor. Now that you have your layered rugs on your floors make sure they stay put! Area rugs have a tendency to wrinkle and buckle even when placed on top of another rug. While your rug will not move around too much on top of another rug, prevent any hazardous buckling with the proper rug pad. Our No-Muv rug pad is specifically designed for rug on top of carpet. No-Muv will keep your layered rugs in place and prevent any hazard to you and your family. If you are laying an area rug on top of carpet, simply lay No-Muv down first and place the area rug on top. It is that easy! Try out the layered look in your home today and don’t forget to use your No-Muv rug pad! While our felt rug pads are manufactured to be safe for use on all types of floors, our two felt pads also have the benefit of being used effectively on heated floors. Fortunately, the R-Value, or thermal resistance level, is very favorable among our Ultra Premium and Superior felt rug pads. This allows for heat transfer from the floor to the room. In the construction industry, R-Value plays an important role within various levels of the building process. Various elements and products are chosen based on R-Values. Insulation, types of flooring and types of siding, as examples, are rated by R-Values and can determine the integrity of the final building project. When it comes to the interior of the home, there are some items that can be used based on R-Values and this can contribute to a more comfortable and efficient home. We hear a lot of requests for our rug pads from homeowners who have radiant heat flooring. These floors can be wood, tile or stone with heat under them. The most important aspect of this type of floor heat is that it is able to escape into the room and home. Generally, area rugs allow for transfer of heat, yet since every area rug should have a rug pad under it, the rug pad must be suitable for radiant heat floors. The pad should allow for heat transfer and it should not be harmful to the floor. There are many types of rug pads containing adhesives that are known to stick to and damage the floor, so it’s important that our rug pads remain free of these agents that can damage the floor. When we manufacture our felt rug pads, we maintain their use on heated floors in two ways; They allow for heat transfer with low R-Values and they are safe for heated floors because they do not contain the sticky adhesive or chemicals of others that can actually cause damage to the floor. Ultra Premium is a felt and natural rubber rug pad and Superior is all felt. Since it has rubber in it, Ultra Premium possesses a slightly higher R-Value than Superior, yet both rug pads effectively allow for heat transfer from heated floors. Our felt is porous and the R-Values are s such; Ultra Premium is rated with an R-Value of 2.25 and Superior with an R-Value of 1.09. The lower the R-Value, the less resistant the product is as it allows full transfer of heat. Comparing our felt rug pads, while they both allow for heat transfer, Ultra Premium contains rubber and allows for slower transfer. So, there’e the fact that felt rug pads for radiant heated floors allow for heat transfer and then there’s the fact of whether or not the rug pads will be safe for the floor. Fortunately, when we manufacture our rug pads, we do not include any additives, chemicals or adhesives. Instead, we use pure recycled felt and 100% natural rubber, materials that are known to be safe for all floors, even heated ones. Many people ask whether or not the rubber in Ultra Premium will actually stick to and stain the floor and our answer is no – We need to remember that we only use a layer of natural rubber that is not treated with any sticky adhesive. It is the adhesive within a rug pad, whether it is a all felt or felt and rubber rug pad, that can cause damage to the heated floor. The interaction of the adhesive with the heat can cause significant sticking and staining of the floor. Our all natural felt rug pads are completely safe for all floors, heated as well. If you have the luxury of living with heated floors, there’s no need to compromise on your floor coverings. Fortunately, there are area rugs and rug pads that are rated for use on radiant heat floors and allow for efficient heat transfer from the floor to the rest of the home. Take care to steer away from those rug pads that are made of plastic, nylon or PVC and are covered in adhesives – These will easily and quickly have a negative reaction with the heated floor to cause significant damage to the floor. In regards to their effectiveness on heated floors, make sure the rug pads possess a low R-Value to allow for easy heat transfer. Regardless of how careful we are as parents, it seems inevitable that babies and younger children will explore and find things to do that may cause harm to themselves. Based on this fact, there are certain things that can be done in the home to make it as childproof and safe as possible – The addition of the right rug pad under your rugs can prevent harm to children. One of the most popular reasons a rug pad is used under an area rug is to prevent the rug from slipping on the floor. That said, there are also a variety of other reasons to use a rug pad, such as preventing damage to a rug, adding extra comfort to a hard floor, insulating against noise and cold and preventing harm to children. While not often thought of for this reason, rug pads can actually protect our children against common reasons for harm – They can prevent trips and falls, as well as create a cushion against hard falls. One of the facts we know about children once they know they have graduated from crawling to walking is that they love to run! Whether it be running to us, running away from us or running to something that interests them, children seem to test themselves to see how fast they can get there. When there are area rugs on the floor, running across them most often leads to slipping, which can lead to falling. It is mandatory to use the proper non slip rug pad under the rugs to prevent common slips and falls. Since most non slip pads in most stores are the thinner mesh pads, it is important to choose one that can also cushion any possible falls that occur – We discuss these types of pads later in this article. Unfortunately, many of the rug pads found today contain some sort of chemical based element – This can be in the form of an adhesive, plastic or glue that is contained within a rug pad. When such rug pads are used under area rugs, there can be various levels of odor that come from them – Normally, the warmer the room, the stronger the odor. In a room with direct sunlight, often when the sun hits the floor, a strong chemical-like odor is dominant – This is the off-gassing property of the adhesive within the rug pad. To assure complete safety for your children against any chemicals, be sure to choose a natural rug pad to use under your rugs. This can be in the form of natural rubber, natural felt, natural wool or natural memory foam – While these are natural materials, we caution against any adhesive coatings on these pads. There are few suppliers who do not add any adhesive or chemicals to their rug pads, hence keeping them as natural as possible. One of the most common reasons of harm to children is a result of falling. Whether a child runs and falls or climbs a chair and falls, the action of falling is quite common and most often is accompanied by a bump to the head or a bruise to another part of the body. In any case, regardless of the reason of the fall or the area of the body that was harmed, it is very desirable and highly recommended to use the right rug pad to cushion the fall – This can most often prevent bumps and pain to the child. It is best to choose a thicker, more dense rug pad for this type of prevention. There are various rug pads available to cushion the fall of a baby or child and sometimes the obvious is not the best choice – Most people would consider the thickest rug pad to be the best to use in this situation. While thickness is one variable to consider, we must also consider the density of pad – The manner in which the pad resists penetration to the floor. The higher the density, the less likely the child will feel impact against the floor and this can prevent bumping the head or other parts of the body. For example, traditional foam carpet padding is available in a plush 1/2″ thickness, yet poses harm for falls – The foam allows penetration to feel the hard floor underneath the pad and this allows a child’s head to hit the floor. Since many manufacturers and sellers of rug pads care about making as much money as they can, they often cut corners in regards to production – They often use inferior quality materials within their pads and most often this includes glue or adhesive. Manufacturing on a quality level requires much time, money and determination to offer the finest quality rug pads available. Rug Pad Corner is a family owned company and we run every aspect of our business as if our children were involved. We use the most natural materials, we never include any additives and we make them as dense as possible, not only for the protection of your rugs and floors, but also for the protection of your family, especially the children. Shop Rug Pad Corner today and learn what it’s like to offer the most natural protection to your family. Before Rug Pad Corner, Shelley’s rug would always bunch up whenever her kids used the living room. Now she doesn’t have to worry about her rug or her kids slipping on the floor! Summertime is the perfect time to throw laid-back parties. The weather in the summer provides the perfect outdoor atmosphere to create a low-key, budget-friendly affair. Check out our advice on how to throw an easy-going summer party this season that you and your guests will love! Candles are a great way to provide soft light for your outdoor table as the sun goes down. Get creative with your candle holders by adding woodsy or beachy details. Curl a wide green leaf (for example, the leaves of a fern) and place it inside a mason jar. Once the leaf has lined the inside of the mason jar, fill the jar with water and float a tealight in it. If you want to go for a more beachy look, fill your mason jars partway with sand and place a decorative shell on top next to your tealight. It is an easy and chic way to light your party. If you are planning on having a large get together and don’t have enough space to fit everyone at one table, try fashioning one of your own. Purchasing a new outdoor table for one party is a waste of money, instead make one with two sawhorses and a board. If you don’t have a sawhorse, ask around to your neighbors or fellow guests to see if they have any they are not using. You only need two sawhorses, unless you want to create a larger table to fit all the guests together. Find a board that can be used as the table top and simply place it on top of the two sawhorses with a tablecloth. If you have an old piece of plywood or an old door, these should work perfectly as a makeshift table top. One of the biggest problems with an outdoor party are the bugs. Try keeping the bugs at bay by purchasing citronella tealights and torches. While these don’t repel all bugs they can help to reduce the amount of bugs that will bother you and your guests. There are now organic sprays you can use in area of party right before it begins! We love those! If you have some kind of water feature at your home, or flower pots or basins not daring, be sure to dump water and skim or treat features throughout the summer to keep mosquitoes from breeding there. If bugs are really bad in your area, look into getting a natural lawn treatment or plan your party in a screened in porch if you can. While ice chests are very convenient for keeping drinks cold, they often can look a little tacky. Instead of using a store bought ice chest, set up one of your own using found materials around your house. If you have a wood crate, wheelbarrow, garden cart, even a large unused flower pot, simply line the container with plastic and fill with ice. The ice will not last as long as it would in an ice chest but it should at least last for the whole party. Plus it will add flair to the celebration! While parties are meant to be a time for everyone to get together and enjoy each other’s company, that does not mean your guests can not help out during the party. Giving your guests one or two tasks is a great way to reduce your stress and prevent any awkward inactive moments. Have one guest prepare the garnishes for the drinks while another guest prepares the drinks themselves. If you have a friend that loves to garden, send them out to collect flowers for a bouquet for the dinner table. Another way to prevent any awkward moments during your party is by setting up activity zones. Activity zones are perfect for larger parties so guests are not crowded together in one area. Create the zones with various seating arrangements. Set up a bar area with seating close-by, a general dining area, a lounge area with more comfortable seating, and a seating around a fire pit. To keep your outdoor furniture in place throughout the party, try using our DURA-GRIP furniture grippers. These grippers will keep your furniture in place no matter how rowdy your guests get! To make your lounge area extra cozy, add an indoor/outdoor rug. Indoor/Outdoor rugs are great at making an outdoor space feel like home! An area rug can also help to distinguish between activity zones. Be sure to keep your floor safe by adding a non slip pad under any rugs you use. By setting up distinct areas, larger gatherings can feel more manageable. Make this Summer one to remember by throwing an easy summer party that you and your friends will love! People produce large amounts of waste every year. Whether it be from food, cleaning supplies, or beauty products, we cannot avoid producing waste. While eliminating all waste is impossible, even adopting a couple of sustainable ideas can help to reduce waste significantly in your home. We have outlined some of the easiest ways to reduce waste in your home. Help improve your environment and your home by adopting some of these practices! Buying in bulk is a great way to reduce container waste. Most of the waste we produce comes from the non-recyclable plastic containers that food and beauty supplies come in. By buying in bulk you can reduce your the amount of plastic containers that you and your family go through. When buying food in bulk, be sure to invest in airtight containers so your food will not spoil. By combining bulk food items with fresh ingredients like fruits and vegetables you can significantly reduce your waste and your exposure to preservatives. Buying food in bulk also incentivises you to cook at home more, reducing carryout container waste. Summertime is the perfect time to start this practice. With the abundance of fresh produce that is available during the season, you can buy what you need fresh, and buy everyday essentials in bulk. Also look into buying your beauty supplies in bulk. Many beauty supplies brands sell their products in bulk. If you have a family, figure out what shampoos, conditioners, soaps, and lotions you can share and buy them in large amounts. This will reduce plastic waste significantly. If you are feeling motivated, try making your own lotions and soaps. Making your own moisturizers can reduce costs and ultimately be healthier for your skin but reducing the need for processed products. Much like beauty supplies, cleaning supplies can be easily made at home with a small number of ingredients that you can purchase in bulk. By making your own cleaning supplies you can reduce your use of disposable plastic spray bottles and other non-recyclable materials. Most cleaning supplies on the market today are toxic and can be harmful to young children if ingested. By making your own cleaning supplies you can monitor what exactly is going into them and that will ultimately make you more knowledgeable about what is harmful for your family. Most cleaning supplies can be made with Castile soap, vinegar, and baking soda. Vinegar is a great all purpose cleaner that is non-toxic. Castile soap can be used as a laundry detergent, mopping solution, dish soap, and a carpet cleaner. Combining castile soap, water, and baking soda makes a super easy scrub for wash tubs and sinks. Once you buy ingredients in bulk, the options are almost limitless! A majority of our waste also comes from the gas we release into the air everytime we drive. If you live in an area where you have to drive to work everyday this cannot necessarily be avoided. But if you live close enough to your work to bike or walk consider switching. Plan out any car-essential errands and group them on a single day. Try to manage it so you reduce your shopping trips to once a week. If you are able to, try to set up a carpool system with you and your local co-workers so that you can all reduce your fuel consumption. On days off, instead of driving, try doing outdoor activities that are nearby so you can walk or bike to them. By adopting even a couple of these, you can reduce your fuel consumption and reduce the amount you spend on gas from week to week. Buying natural fibers for your household can ensure that your fabrics are recyclable and can eventually go back to the earth. Look for linens and clothing that are 100% cotton, wool, hemp, or bamboo. When purchasing rugs for your home, look into natural fiber rugs such as; wool, seagrass, jute, and sisal. If you want a colorful rug, make sure the dyes used are all natural and non-toxic. These products are typically biodegradable and will reduce waste. Here at Rug Pad Corner we make sure that every product we sell is 100% natural and healthy for your home. Our Super Hold Rug Pad is made of 100% rubber and the color is derived from completely natural dyes. Our Superior Rug Pad is 100% natural recycled felt. We even use our patented Heat Press technology to avoid any need for harmful adhesives. By staying completely natural with our products, we can ensure that everything we sell is environmentally sustainable and completely safe for your home. Last but certainly not least, be sure to reduce the amount of surfaces in your house that collect dust and junk. By reducing the amount of surfaces in your home you incentivise yourself and your family to reduce the amount of junk your family collects. Reducing surfaces also reduces the need dusting and upkeep of these surfaces. This does not mean your house needs to feel empty. But rather, fill your home with the necessities and eliminate clutter. These tips are meant to help you reduce waste in your daily life. Adopt one or go big and try them all out. Either way reducing waste can help you live a healthier life in the long run. Spread these tips to your family and friends to make our community more conscious of the waste we produce!